Mice with defects in intestinal epithelial permeability develop more severe steatohepatitis when placed on a diet high in saturated fat, fructose, and cholesterol (HFCD) than control mice, and colon tissues from patients with non-alcoholic fatty liver disease (NAFLD) have similar defects in intestinal epithelial permeability, researchers report in the October issue of Gastroenterology. Restoration of intestinal barrier integrity and manipulation of gut microbiota might therefore be developed as therapeutic strategies for patients with steatohepatitis. 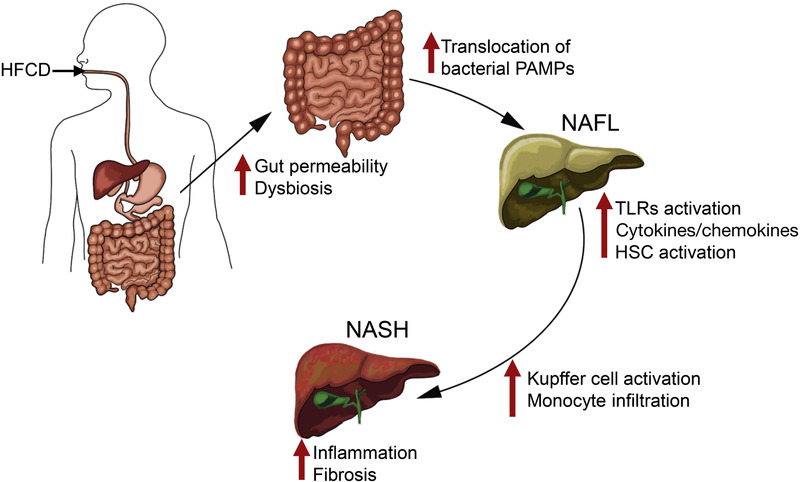 A diet high in saturated fat, fructose, and cholesterol increases intestinal epithelial permeability and microbial dysbiosis, leading to increased translocation of pathogen associated molecular patterns (PAMPs) and NAFLD. This leads to activation of Toll-like receptors (TLRs), production of cytokines and chemokines, and hepatic stellate cells (HSCs), and then activation of Kupffer cells and monocyte infiltration of the liver. This inflammatory response results in fibrosis and NASH. The intestinal epithelium provides a barrier to prevent intestinal microbiota and microbial products from entering the systemic circulation. Tight junctions, adherens junctions, and desmosomes connect epithelial cells to form this selectively permeable epithelial barrier. NAFLD has been associated with increased gut permeability and small intestinal bacterial overgrowth. Increased intestinal epithelial permeability correlates with increased serum levels of endotoxin, which induces hepatic inflammation. However, it is not clear whether intestinal epithelial barrier dysfunction is a cause or consequence of chronic systemic inflammation observed in patients with nonalcoholic steatohepatitis (NASH). Khalidur Rahman et al investigated the role of intestinal epithelial permeability in progression of NAFLD using junctional adhesion molecule A (JAM-A) knockout mice (F11r-/-), which have a defect in the intestinal epithelial barrier. JAM-A is a component of the tight junction complex that regulates intestinal epithelial paracellular permeability. F11r-/- mice therefore have leaky tight junctions that allow for translocation of gut bacteria to peripheral organs. Rahman et al used these mice to study the role of intestinal epithelial permeability in development of hepatic steatohepatitis. Male C57BL/6 (control) or F11r-/- mice were fed a normal or a HFCD for 8 weeks, and then liver tissues were collected and analyzed. 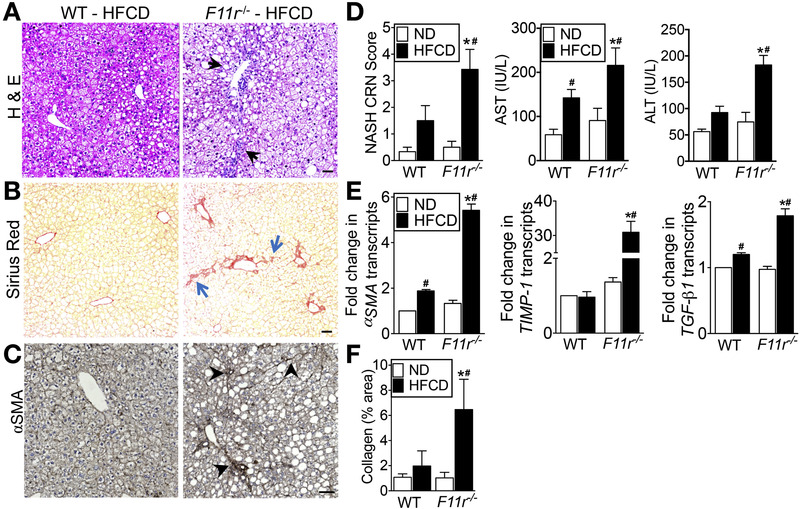 The authors found that F11r-/- mice fed a HFCD, but not a normal diet, developed histologic and pathologic features of severe NASH: steatosis, lobular inflammation, hepatocellular ballooning, and fibrosis, whereas control mice fed a HFCD developed only modest steatosis. Interestingly, there were no differences in body weight, ratio of liver weight:body weight, or glucose homeostasis between control and F11r-/- mice fed a HFCD. 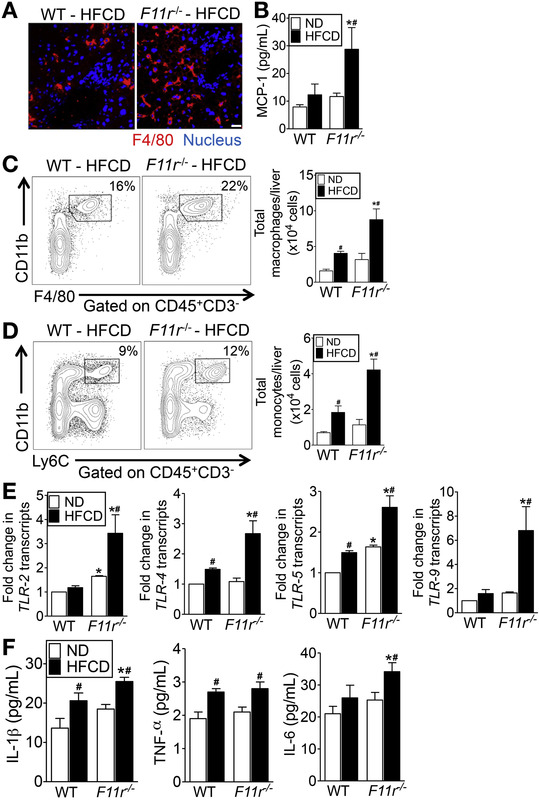 All mice fed the HFCD developed features of metabolic syndrome. However, only the F11r-/- mice developed significant NASH on the diet. 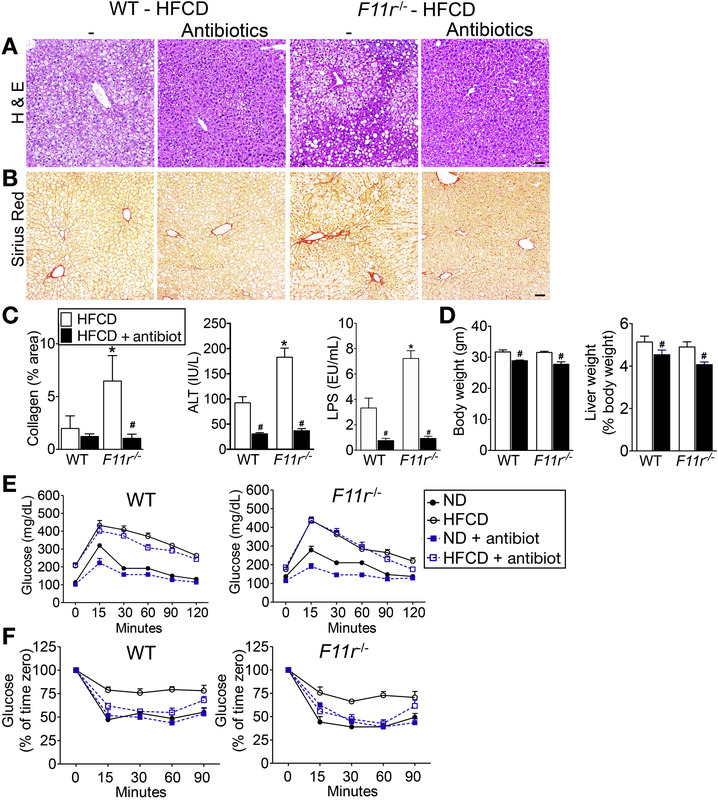 In the F11r-/- mice on the HFCD, liver injury was associated with significant increases in mucosal inflammation, disruption of tight junctions, and intestinal epithelial permeability to bacterial endotoxins, compared with control mice or F11r-/- mice fed a normal diet. 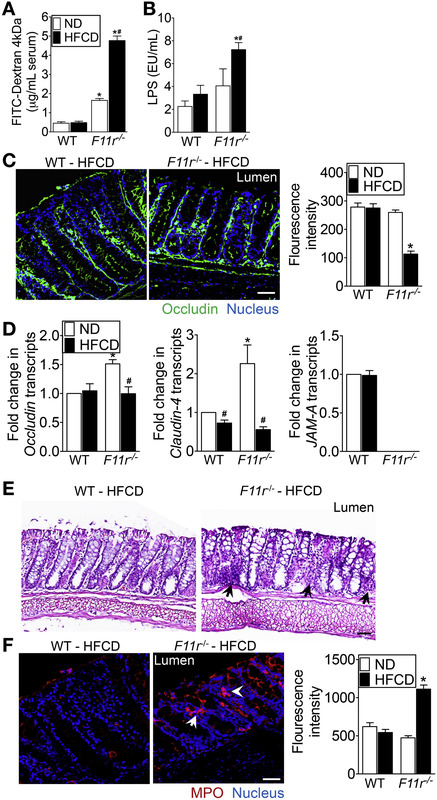 The authors showed that consumption of the HFCD was responsible for further deterioration of intestinal epithelial barrier function, and was essential for NASH development, in F11r-/- mice. 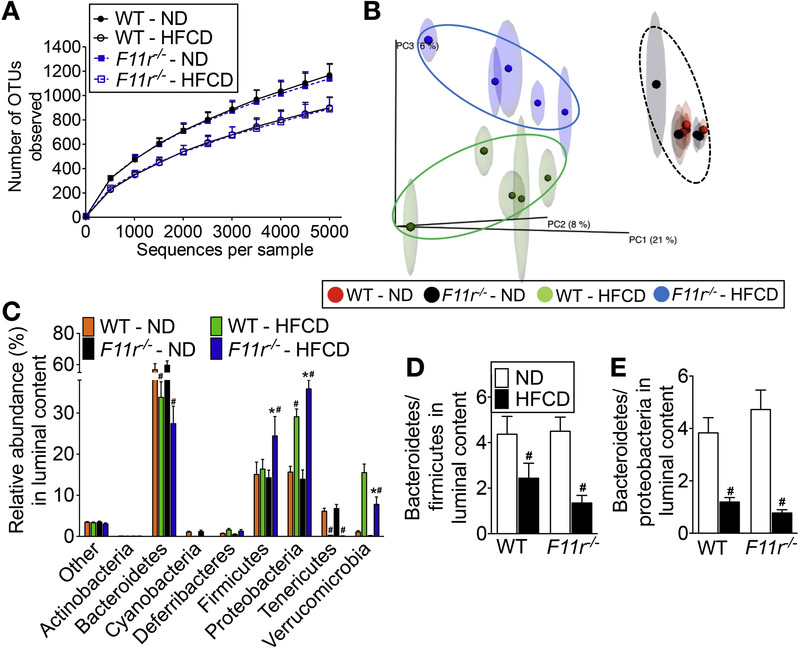 The HFCD led to a significant increase in inflammatory microbial taxa in F11r-/- mice, compared with control mice. Administration of oral antibiotics or sequestration of bacterial endotoxins with sevelamer hydrochloride reduced mucosal inflammation and restored normal liver histology in F11r-/- mice fed a HFCD. These findings indicate a role for gut microbial products in hepatic inflammation. Rahman et al analyzed biopsy specimens from proximal colons of 30 patients with NAFLD and 19 subjects without NAFLD (controls). They found protein and transcript levels of JAM-A to be significantly lower in the intestinal mucosa of patients with NAFLD than controls; decreased expression of JAM-A correlated with increased mucosal inflammation. The authors propose that loss of JAM-A contributes to pathogenesis of NASH in humans. Rahman et al state that their findings indicate the role for intestinal epithelial permeability in NASH progression, and the complex role of diet in regulating intestinal homeostasis, inflammation, and liver health (see model). Genetic variants that affect intestinal epithelial barrier integrity could put certain individuals at risk for NAFLD progression. The HFCD-fed F11r-/- model overcomes limitations that have hindered other models of NASH and combines features of the metabolic syndrome, hepatic inflammation, and fibrosis. Rahman et al state that the model can be used to gain mechanistic insights into NAFLD pathogenesis and progression.